Attention is the scarcest resource in the internet age. The relentless tide of digital stimuli is challenging consumers’ ability to concentrate like never before. In order to be truly seen and heard, organisations must endeavour to cultivate in-depth focus rather than fleeting moments of attention. We examine the drivers behind this focus deficit and show how to apply a Focus Filter to your brand output to secure more meaningful audience engagement. Key drivers include how constant multi-tasking and multi-screening are lowering consumers’ concentration levels; the clickbait phenomenon and its effect on society; and how 21st-century life is suffocating the subconscious well of creativity. The focus deficit is driving the rise of Anti-ADD Hacks for distracted minds; Concentration Pods that encourage alone time; a resurgence in the scheduled mentality of broadcast tv; and new avenues for storytelling driven by virtual reality. The rise of ethically responsible interaction design; how AI is helping consumers to function like humans again; virtual wellbeing spaces that combine the best of both worlds; and serenity as a monetised luxury good. 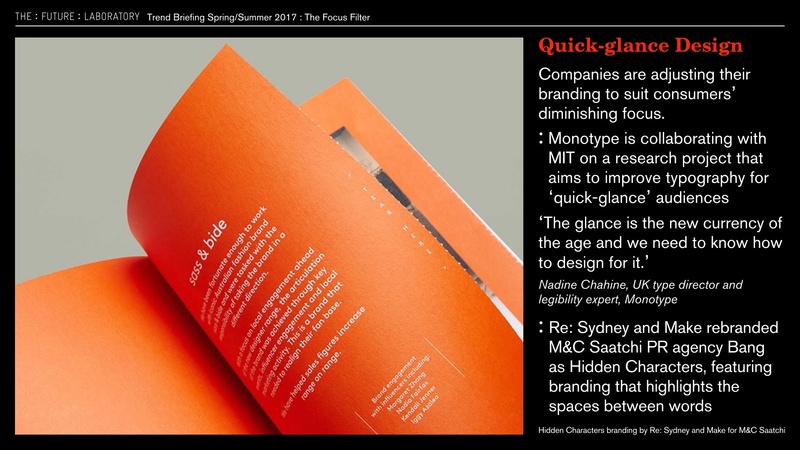 This highly practical presentation is packed with suggestions on how to apply The Focus Filter, from using design and typography to engage a ‘quick-glance’ audience to using silence as a tool to stand out amid the noise.